The spectroscopy IR detector market is estimated to be worth USD 224.5 Million by 2022, growing at a CAGR of 6.9% during the forecast period; the market size, in terms of volume, is expected to grow at a CAGR of 7.7% during the same period. The objective of this report is to estimate the size, in terms of value and volume, and future growth potential of the IR detector market for IR spectroscopy across different segments such as detector technology, spectrum sensitivity, product type, cooling requirement, and geography. The base year considered for the study is 2015 and the forecast period is between 2016 and 2022. This report provides detailed information regarding the major factors influencing the growth of the IR detector market such as drivers, restraints, and opportunities. Along with this, the growth opportunities for the stakeholders have been analyzed by identifying the high-growth segments of the market. The IR detector ecosystem comprises IR sensor/detector component manufacturers such as Hamamatsu Photonics K.K. (Japan), Excelitas Technologies Corp. (U.S.), LASER Components GmbH (Germany) and others; and IR spectroscopy device manufacturers such as Thermo Fisher Scientific (U.S.), PerkinElmer (U.S.), Bruker Corporation (U.S.), and Agilent Technologies (U.S.) among others. 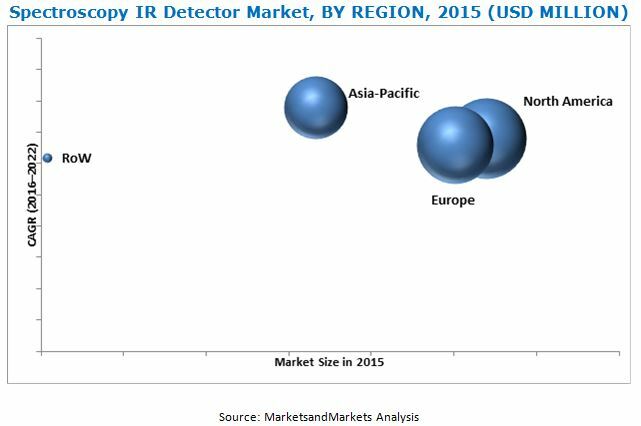 The spectroscopy IR detector market is estimated to be worth USD 224.5 Million by 2022, growing at a CAGR of 6.9% during the forecast period. The market size, in terms of volume, is expected to grow at a CAGR of 7.7% during the forecast period. The major drivers for the growth of the spectroscopy IR detector market include the increasing shipment of IR spectroscopy devices and the industry practice of upgrading old IR spectroscopy devices with new IR detector modules. Along with this, IR spectroscopy is used in the biological sector to identify various diseases. For instance, the Polish Academy of Sciences NaAAcZ Institute of Biocybernetics & Biomedical Engineering, (Warsaw, Poland) has developed an NIR spectroscopy instrument to monitor brain injuries. Such developments in techniques would drive the growth of the NIR detector market in the coming years. The scope of this report covers the spectroscopy IR detector market segmented on the basis of detector technology, spectrum sensitivity, cooling requirement, product type, and geography. On the basis of spectrum sensitivity, the market has been segmented into NIR, Mid IR, and Far IR. Mid IR detectors are expected to hold the largest market share, during the forecast period. The market has been segmented on the basis of detector technology into mercury cadmium telluride (MCT), deuterated triglycine sulfate (DTGS), indium gallium arsenide (InGaAs), and others. InGaAs-based IR detectors are expected to play a key role in the growth of the IR detector market because of the wide application of InGaAs-based IR detectors in NIR spectroscopy devices. The spectroscopy IR detector market, on the basis of product type, has been segmented into benchtop spectroscopes, microspectroscopes, portable spectroscopes, and hyphenated spectroscopes. The portable IR spectroscopy device market is expected to grow in the near future and drive the IR detector market in this segment during the forecast period. The market, on the basis of geography, has been segmented into four regions—North America, Europe, APAC, and RoW. North America held the largest market share in 2015; however, the market in APAC is expected to grow at the highest rate between 2016 and 2022 owing to the growing industrialization in this region. The availability of substitute products for IR spectroscopy devices acts as a major restraining factor for the growth of the market. The major companies operating in the IR detector market include Hamamatsu Photonics K.K. (Japan), Excelitas Technologies Corp. (U.S.), LASER Components GmbH (Germany), UTC Aerospace Systems (U.S.), Newport Corporation (U.S.), and others. These players have adopted various strategies such as new product developments, expansions, mergers, partnerships, and collaborations to cater to the needs of the IR detector market for spectroscopy.